Using a natural bristle brush to apply oil base deck stain to floor boards. Unless you choose to use a sprayer, you’ll need to use a brush at some point in your deck staining project. 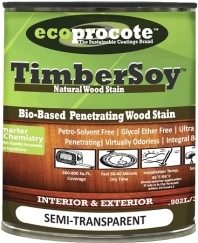 Even when a sprayer is used, back brushing can be a useful technique for ensuring maximum penetration of the stain. 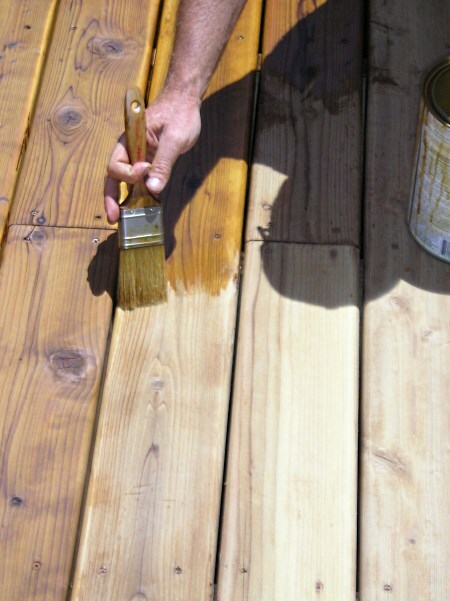 The most common method of applying deck stain is, by far, brushing. There are a couple of important rules to keep in mind. Use the appropriate brush type. Oil based products require natural bristles; water-based stains call for high quality nylon brushes. Use the appropriate brush width. For most areas, a 4″ brush will provide the perfect combination of control and quick application. Use a smaller brush for more detailed areas. Always maintain a wet edge. If the stain dries between strokes, you’ll end up with unsightly brush strokes or “lap marks.” For the same reason, never stop staining in the middle of a board; wait till it’s completely covered before taking a break. Apply the stain to 2-4 boards at a time. Limiting application to a single board at a time is too time consuming. Covering more than four boards at a time can make reaching awkward and also makes it more difficult to maintain a wet edge. Work backwards when working with a full brush. Apply deck stain approximately six inches in front of the previously finished area, brushing back towards the stained section and blending the two sections together. Apply the stain very generously, and work as quickly as possible. Never dip your brush more than 1/3 of the way up the bristles. It’s better to dip the brush frequently. A brush that is too full of stain tends to lay stain down unevenly. One of the advantages of working with the brush is the fact that the strokes work the stain into the grain. If you find that the stain isn’t laying down as evenly as you wish, go ahead and brush the area again to even the distribution of the stain. If you’ve used a roller or wool pad to apply the stain, you can even out the pockets of concentrated stain by brushing back and forth. Rollers and pads make a mess when they are used against a wall. Professional painters always use a brush to paint a section parallel to the wall that is between 3 and 4-inches wide. This allows you to overlap the roller and pad an inch or two into the cut-in section.